Claiming two race wins and a runner-up result Max Nagl was in dominant form at the Hawkstone International MX. With the German topping the overall standings, Max Anstie and Gautier Paulin secured second and fourth respectively in MX1. Completing a great day of racing for Rockstar Energy Husqvarna Factory Racing Thomas Kjer-Olsen and Thomas Covington finished second and third in MX2. 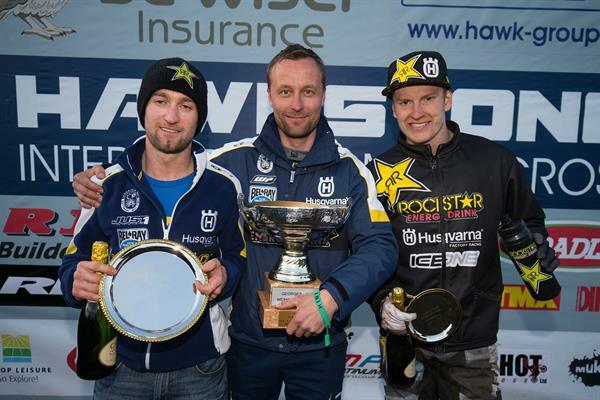 With the event forming part of their preparations for the 2017 FIM Motocross World Championship, Rockstar Energy Husqvarna Factory Racing riders mixed things up with the international elite in England. Crossing the line second in the opening race, Max Nagl improved his pace in the remaining two motos of the day. With his victory in race two helping the German secure the overall win in MX1 class, Nagl went on to wrap up a solid day aboard his FC 450 machine with victory in the combined MX1/MX2 Superfinal. In what was just his second international event aboard the FC 450, Max Anstie was a strong contender for the top spot in each of the three motos at the sandy British track. Getting the holeshot in the opening race the young Brit put in a strong ride to claim an emphatic victory. Following another holeshot in moto two, Anstie found himself leading the race before a crash forced him to battle hard for fifth at the chequered flag. Pushing hard for the top, Anstie concluded his day with third in the Superfinal. Rockstar Energy Husqvarna Factory Racing’s Gautier Paulin was also a force to be reckoned with in England. Battling his way forward following a mediocre start in moto one the Frenchman came home in sixth place. Gautier’s best performance for the day came during moto two, with the Frenchman earning the runner-up spot behind his teammate Nagl. The Hawkstone International MX marked the first competitive outing for Rockstar Energy Husqvarna Factory Racing’s 2017 MX2 squad. Showing impressive speed at the rough British track, team rookie Thomas Kjer-Olsen earned 3/2 results in the two MX2 motos to earn second overall. Claiming sixth in the Superfinal, the young rider from Denmark was also the second fastest MX2 rider in the day’s final race. For Thomas Covington the Hawkstone International MX provided a good opportunity for the young American to capitalise on all the hard work he’s done during the off-season. Claiming second and sixth in the two motos respectively Thomas wrapped up the day with third in MX2 category. Racing in front of his home crowd Conrad Mewse had an event of mixed results. Getting the holeshot in moto one, the young Brit lost precious time after stalling his bike and eventually finished 11th. Improving to fifth in moto two, Conrad wrapped up the day with eighth overall in MX2 class. The Rockstar Energy Husqvarna Factory Racing team members will be back in action on February 12 at the Lacapelle Marival International MX in France. It will be their last international event before the start of the 2017 FIM Motocross World Championship in Qatar on February 25/26.